Hair transplant is a relatively new and continuously evolving art, which has seen several advances, paving the way for more natural results for patients. As with any other surgical procedure, complications may occur, and these present a major challenge for the surgeon and the patient. With increasing popularity, the number of surgeries continues to rise. More importantly, as the technique becomes popular, doctors from different specialties, often with inadequate training, have performed the surgery, and consequently, the total number of complications has shown an increase. A complication is an adverse event that is not considered to be a common or usual occurrence and which requires a change in methodology. Hair transplantation is a cosmetic surgery, and hence, any complication can seriously impact the cosmetic and psychological outcome for the patient and can have medicolegal implications. Hence, the surgeon and the staff should be familiar with all possible complications, techniques for prevention, and also techniques for their management. Anesthesia: Adverse systemic reactions to local anesthetics fall into four categories: toxic, psychogenic, idiosyncratic, or allergic. The overwhelming majority of adverse reactions to local analgesics are psychogenic in nature and related to fear. True immunologic reaction to a local anesthetic is rare. Irrespective of the fact that a patient has received local anesthesia in the past, we advocate sensitivity testing for all. Intraoperative complications: Tachycardia can occur when tumescent fluid containing adrenaline is given. This is usually transient. However, in a patient with cardiac compromise, this may pose a risk. Hence in all patients, particularly those above 40 years of age, an electrocardiogram and physician assessment for anesthesia fitness are indicated. It is also recommended to monitor heart rate and blood pressure levels throughout the procedure, especially during anesthesia administration. Although prophylactic antibiotics are routinely administered, their value remains controversial. Infection may occur due to nonadherence to aseptic norms of surgery or lowered patient resistance. Proper post-op instructions regarding washing and wound care should be explained in detail because failure to follow these may cause infection. If infection does occur, application of appropriate antibiotics after sensitivity testing is necessary. Lower risk of infections has been reported by treating nasal colonization of Staphylococcus aureus by the application of mupirocin ointment and preoperative shampooing of scalp hair with the use of chlorhexidine gluconate–medicated soap the night before and the morning of surgery. Open wounds are maintained using a moist dressing protocol and are allowed to heal via secondary intention. Secondary scar revisions can be performed at a later date on complete resolution of the inflammatory process. Donor-site wound dehiscence is extremely uncommon because higher vascularity of scalp favors faster healing of incisions. However, circulatory compromise occurring because of factors such as diabetes, a high-tension closure, coexisting suture line infection, premature removal of sutures, and excessive early physical activity places the patient at a greater risk for unexpected donor-site dehiscence. Layered wound closure, post-op local wound care, delaying suture removal, and patient counseling regarding avoidance of rigorous physical activity are some simple measures to prevent this consequence. Necrosis and wound dehiscence: Wound dehiscence, a rare phenomenon, is a sign of delayed healing or nonhealing. Necrosis of the wound margin is a result of ischemia. A technical error during closure creating excessive tension along the incision line can produce localized microcirculatory collapse resulting in necrosis. It is a serious complication because the soft tissue gets destroyed, and in the process, the follicles within the area get permanently damaged. Predisposing factors are prior scalp reduction or previous strip harvesting, diabetes mellitus, smoking, donor-site scarring, and intraoperative mishaps such as inadvertent transection of the occipital artery.Caution is advised while closure to avoid excessive tension along incision line, especially near the area superior to the mastoid process, and in wide strips done for mega sessions. Preoperative daily scalp massage may improve scalp laxity before the surgery. Avoiding any forced wound closure and using a multilayered closure to approximate only those areas along the incision line with favorable tension dynamics are advised. 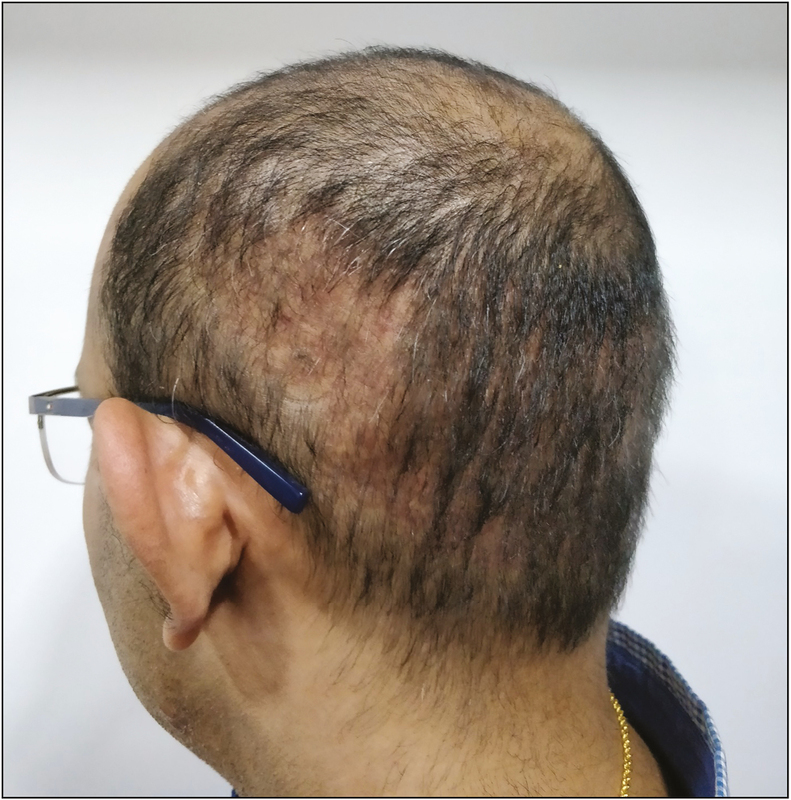 Donor hair effluvium: Commonly referred as donor shock loss, it can be seen above and below the line of incision but is usually temporary, and full recovery is almost always seen in the following 3–4 months. 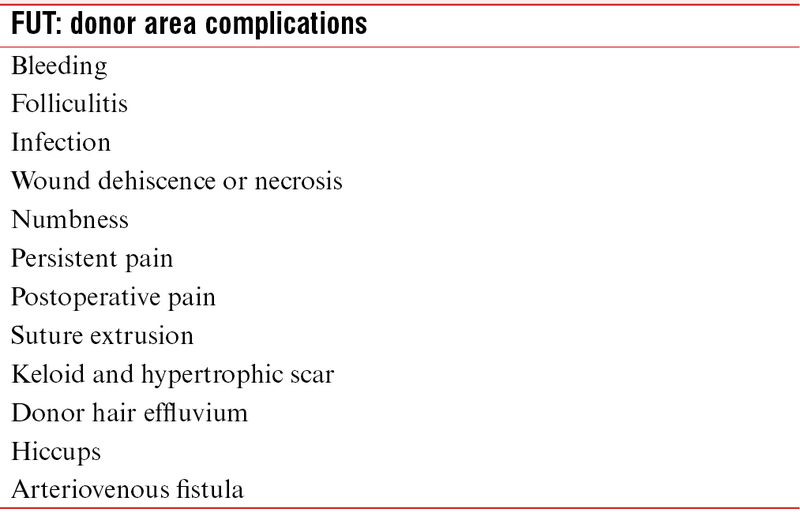 Surgical consequences such as alteration of natural follicular population, edema, inflammation, and suture line vascular compromise are probable causes. A dramatic hair loss may be seen in accidental major vascular damage. Local wound care with daily cleaning and topical antibiotics along with measures to control post-op inflammation has been advocated. Topical minoxidil also helps in faster recovery. Scarring: Konior has described the various types of scarring, such as wide scar, crosshatch scar, visible scar, and keloid and hypertrophic scar, which are possible following strip excision. Wide scar, though uncommon, is a possibility as a result of faulty surgical technique or poor patient compliance [Figure 1]. Scar maturation takes weeks or even months, which leaves the wound strength vulnerable to patient activities after suture removal. Neck flexion restrictions if not followed may increase donor-site tension resulting in wide scars. Crosshatch scars may be seen due to tight closure resulting in pronounced edema creating a strangulation effect on the skin surface arising from snug overlying sutures or staples. A critical pressure force will cause a suture loop or staple crown to cut through the skin with a resulting crosshatch scar pattern that runs perpendicular to the donor incision line. Use of multiple donor incision lines scattered throughout the donor region. Strip excisions that are placed in the inferior donor region where the prevalence of scar stretching is increased. When strip harvests venture superiorly into donor-site fringe zones that possess a risk for future thinning. Visible scarring is one complication that brings the strip dissection to disrepute as young men have a tendency for changing their hair styles, and with short hair, the scar becomes visible. Hence, this needs to be avoided at all cost. Keloid and hypertrophic scars: Keloid or hypertrophic scar is a rare entity and occurs because of exaggerated response to healing. In hypertrophic scar, normal surrounding skin is not involved as seen in keloid. Local steroid ointment application or steroid injection is needed. Keloid involves normal surrounding skin. Most of the time, patient complains of itching, pain, and sometimes pricking sensation over keloid. Intralesional steroid injections control sign, symptoms and growth of the keloid. Keloids are uncommon and can be avoided by careful patient selection. Persistent pain: Neuralgias, neuromas, and hypesthesia: Careless deep incisions can cause transection of the greater occipital, lesser occipital, or auriculotemporal nerves, resulting in hypesthesia localized to the innervation zone. Aberrant neural healing can cause persistent scalp hyperesthesia or regional discomfort. A faulty healing response may also generate a neuroma: a tender, palpable nodule that develops from fibrous tissue proliferation surrounding the injured nerve. Regional infiltrations of local anesthetics and corticosteroids intralesionally can be used to treat neuropathic pain or hypersensitivity arising from an injured nerve. Hematoma: Though rare, deep incisions can lead to donor-site hematomas because of a major artery transection. Limiting donor-site incision depth and carefully exploring the wound bed for the evidence of vascular damage can avoid this complication. Major vessel transections require careful suture ligation for effective control. A multilayered closure technique is preferred to eliminate any dead space that could potentially harbor a fluid collection. An active donor-site hematoma will often produce pain, swelling, and localized ecchymosis. Once established, this complication is best corrected by wound exploration, suture ligation or cauterization of actively bleeding vessels, and layered wound closure. Failure to promptly address this problem within 24h may increase the risk of donor-site necrosis and permanent hair loss. Suture extrusion: Can occur very rarely. Donor-site depletion: Irrespective of whether scoring was performed by manual, motorized, or robotic punches, the risk of a clinically apparent depletion of hair from the donor region because of aggressive and nonuniform harvesting is observed. This may create an iatrogenic “moth-eaten” or “pseudo-syphilitic” appearance [Figure 2]. Pinpoint scaring: It is a misconception that FUE is a scarproof technique. The punch used to harvest each follicular grouping may create pinpoint white atrophic macules [Figure 3]. In the hands of a skilled surgeon, most of them are not visible to the human eye, and even if visible, they are far less noticeable than a linear scar of FUT for most patients. Nevertheless, patients should be informed about the possibility that these pinpoint white scars or hypopigmented macules may be visible on close inspection with short hair. This is more important in patients with skin color types 4–6, common in India, where hypopigmentation is more prevalent. It should be understood that FUE not just removes hair from the scalp but also removes melanocytes, and it is a well-established fact that hair follicles are the reservoir of epidermal melanocytes. Hence, particularly in aggressive FUE with large sessions, thousands of such hypopigmentation can be very apparent on shaving, thus negating the perceived benefit of a minimal scar by FUE. Postoperative effluvium: A possibility of postoperative donor hair effluvium is reported, which can happen post-surgery [Figure 4]. The condition may appear after few days to few weeks of the surgery and show diffuse hair loss. It is mostly temporary and resolves within 3–4 months in most of the cases. The most common cause can be overharvesting and/or hampered blood supply. Buried grafts: They can be seen most commonly when blunt punches are used. If punching is performed in hurry or proper alignment of punch along with hair follicles is not carried out, then the graft is pushed into the dermis leading to buried graft. Overharvesting: It may lead to permanent damage of the donor area, thinning, and patchy hair loss [Figure 5]. Before starting the extraction process, safe donor area should be demarcated and overharvesting should be avoided. Hence, it is preferable not to exceed extraction of more than 1:4 follicular units. Necrosis: Cutaneous necrosis after FUE is uncommon but has been reported in literature. Karaçal et al. 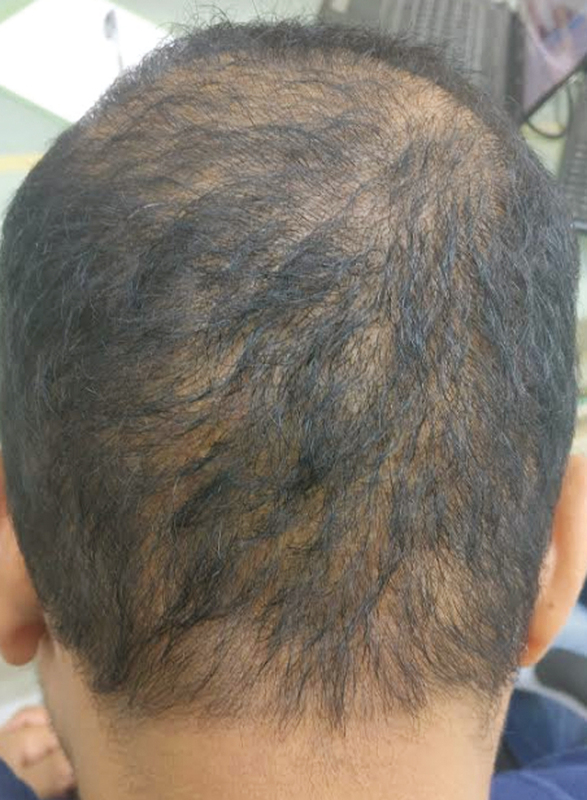 have reported donor-site necrosis after hair restoration with FUE, leading to cicatricial alopecia. Subdermal cysts: They present as multiple, slow-growing nodular, painless swellings in the scalp donor area. Lack of due diligence while performing FUE can lead to subluxation of the grafts into the subdermal layer of scalp. Over tumescence of the scalp donor area, use of blunt punches, and trying to “core” out the full-thickness grafts can all contribute to this. Hence, it is advisable to remove all grafts from the donor area. Other rare complications: Lichen planopilaris has been reported after FUE as well as strip method possibly because of the precipitation of autoimmune reaction of transacted hairs., Alopecia areata is another rare complication. Trichorrhexis nodosa too has been reported. Chronic folliculitis, though uncommon, can be seen as a result of failure to maintain hygiene or because of some preexisting dermatological disorder. This is usually a foreign body reaction to poorly dissected hairs- damaged shafts – Pus is sterile. Aggressive treatment with topical and systemic antibiotics and daily cleansing with antibacterial shampoo are advocated to prevent cicatricial scarring. Poor hair growth may be a consequence of traumatic dissection of the hair grafts from the harvested strip or traumatic placement or desiccation of the grafts. It can also be a result of poor-quality donor hair such as vellus hair, which should be identified before surgery, and thus, such patient should not be selected for surgery. Decreased growth can also be due to factors such as heavy smoking, diabetes, and excessive sun damage to the scalp skin or sometimes due to nonspecific individual anatomic factors. Cysts appear as small skin-colored swellings around the transplanted hair follicles, which can become erythematous and painful. They result because of small grafts slipping under the skin or from piggybacking one graft on top of the other. Treatment consists of incising the cysts and expressing out the contents, using warm compresses, or sometimes applying topical antibiotics. 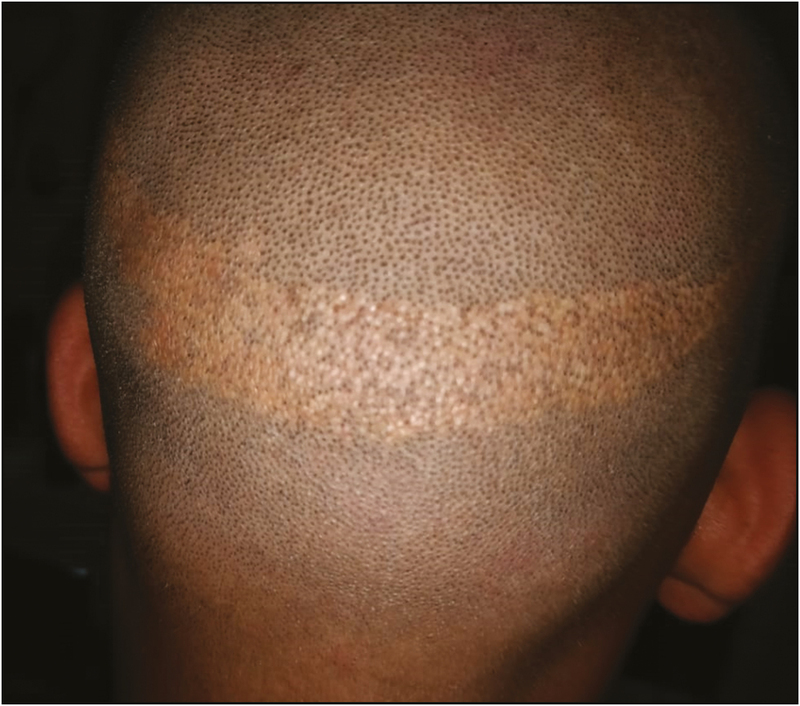 Cobblestoning may be seen around the hair graft as elevations and indentations of the scar tissue, causing an unsightly uneven surface in the recipient area [Figure 6]. Placement of the grafts at incorrect depth or into very small slits is the cause. The grafts should not be placed more than 1–2mm above the surrounding surface. Cobblestoning mostly improves with time or the scars may need to be excised. Unnatural/poor hairline: The surgeon should be very cautious in designing and surgical technique; hairline is the surgeon’s signature. Unnatural appearance of transplanted hair is a complication of a poor design and surgical execution [Figure 7]. Low-positioned hairline and blunting of the temporal angles can occur if placement is below 6cm from the glabella. It creates artificial appearance in cases with higher grades of baldness or global thinning. 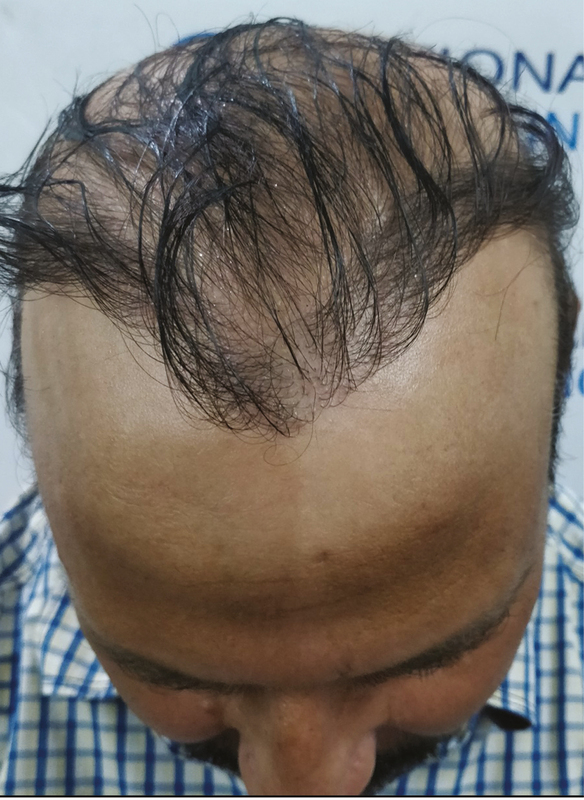 It can also lead to dissatisfaction of the patient over time, especially in the case of evolving progressive hair loss behind the transplanted hairline. 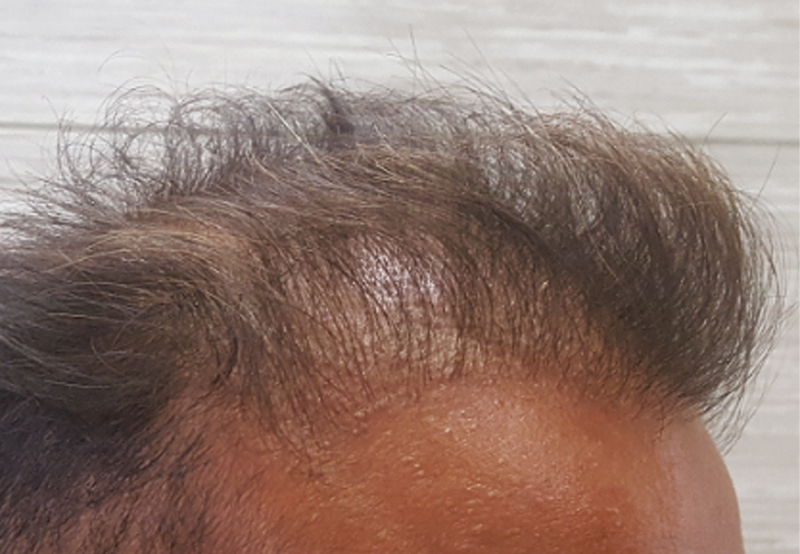 Creating zones of variable density in a patient with a Norwood V pattern to mimic the distribution pattern of hair in someone who is a Norwood III gives a very natural result.Improper angulation of the hair grafts is also a common complication. Follicular single unit or multiunit transplantation is the gold standard in hair restoration surgery (HRS), but the right angle and the direction of the transplanted hair are critical to the outcome and naturalness following HRS, especially in the hairline and frontal areas. Cornrow plugs can still occur if larger units are used for hairline, which gets exposed as the residual hair recedes and then necessitates correction. Therefore, placing one-hair follicular units in the first row and two-hair follicular units behind is the key for successful results; if the planning and surgical technique is not adequate, then it could result in a complication. Edema is not a complication per se, but more of a surgical consequence. It occurs commonly and can persist for 3–5 days. Starting from the forehead, it may also spread to eyelids and nose. Exact cause remains unknown but factors such as large amount of tumescence, gravity pull downward, lymphatic drainage of frontal scalp, loose donor skin, elderly patients, and mega sessions are contributory. An Elastoplast (Global Meditech, Gujarat, India) band on the forehead at the end of surgery may also help. Bleeding is a possibility just like any other surgical procedure, especially in patients on antiplatelet drugs. Postoperative bleeding is usually the result of inadvertent trauma to the scalp, causing the extrusion of one or a number of grafts. This can be controlled by applying steady pressure with gauze over the bleeding area for 10–15min. Central scalp necrosis can occur after large sessions in patients with vascular compromise, especially in the elderly. It heals with central scar [Figure 8]. Although the exact cause is not known, it is postulated that the central scalp receives comparatively less blood supply. Smoking, diabetes, and actinic damage may predispose to the condition. Shock loss or recipient-site effluvium is seen in variable degree in most patients who continue to have preexisting hair within the transplant zone. The reason for this is anagen effluvium, telogen effluvium, or sometimes combination of the two, and typically begins 2–6 weeks following surgery. Higher risk is for females and also patients with advanced miniaturization. The patients can be forewarned about its possibility to alleviate anxiety or alarm. Although most often temporary, it may sometimes cause a permanent reduction in native hair population, particularly in a patient with preexisting miniaturized hairs. Systemic steroids post-op, starting minoxidil early, that is, within 2 weeks of surgery, and even oral finasteride may help in reducing the risk and early recovery. Arteriovenous fistula and aneurysm are rare complications that were more frequent with the old technique but can still be present following the modern HRS. Death: Although no case report of death because of hair transplantation complications is available, one isolated case of death after hair transplantation has been reported in print media. Most of the complications of hair transplantation are avoidable. Detailed history, proper counseling, and discussion before surgery help in proper planning and avoid patient dissatisfaction. FUE was developed to avoid complications of FUT such as wide scar. Though it is a safe method of surgery, it can be associated with complications. Careful screening of the patient to avoid dissatisfaction and unrealistic expectations is of utmost importance. Complications can be avoided by careful planning and sound execution by the surgeon and the team. Patwardhan N, Kirane V, Mysore V. Complications of hair restoration surgery: an overview. In: Mysore V, editor. Hair transplantation . 1st ed. New Delhi: Jaypee Brothers Medical Publishers (p) Ltd: 2016. p. 276-81. Arnold J, Stough DB, Haber RS. Hiccups following surgery of the scalp. Complications. In: Hair replacement. St. Louis, MO: Mosby; 1996. pp. 332-4. Konior RJ. Complications in hair-restoration surgery. Facial Plast Surg Clin North Am 2013;21:505-20. Farjo N. Infection control and policy development in hair restoration. Hair Transpl Forum Int 2008;18:141-4. Kulaylat MN, Dayton MT. 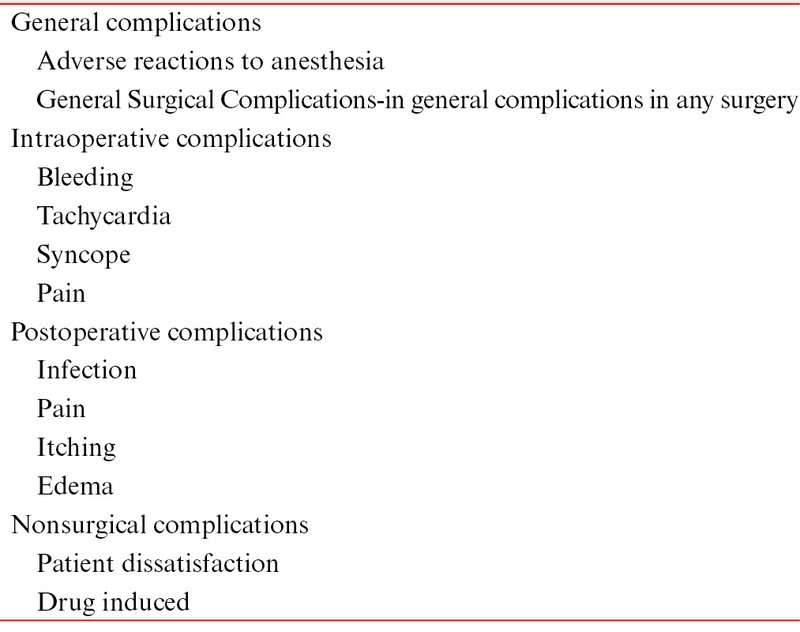 Surgical complications. In: Townsend CM, Beauchamp RD, Evers BM, editors. Sabiston textbook of surgery. 18th ed. Philadelphia, PA: Elsevier Saunders; 2008. pp. 1589-623. Garg A, Garg S. Donor Area Complications of Strip Harvesting. In: Mysore V. editor. Hair transplantation. 1st ed. New Delhi: Jaypee Brothers Medical Publishers (p) Ltd: 2016. p. 282-87. Avram MR, Rogers N, Watkins S. Side-effects from follicular unit extraction in hair transplantation. J Cutan Aesthet Surg 2014;7:177-9. Karaçal N, Uraloğlu M, Dindar T, Livaoğlu M. Necrosis of the donor site after hair restoration with follicular unit extraction (fue): a case report. J Plast Reconstr Aesthet Surg 2012;65:e87-9. Poswal A, Bhutia S, Mehta R. When FUE goes wrong! Indian J Dermatol 2011;56:517-9. Brown MD, Johnson T, Swanson NA. 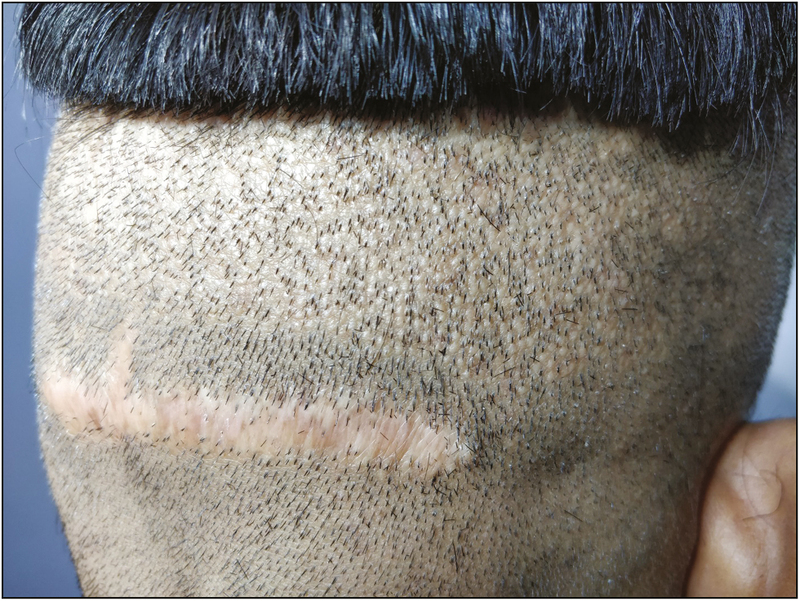 Extensive keloids following hair transplantation. J Dermatol Surg Oncol 1990;16:867-9. Garg S, Kumar A, Tuknayat A, Thami GP. Extensive donor site keloids in follicular unit extraction hair transplantation. Int J Trichology 2017;9:127-9. 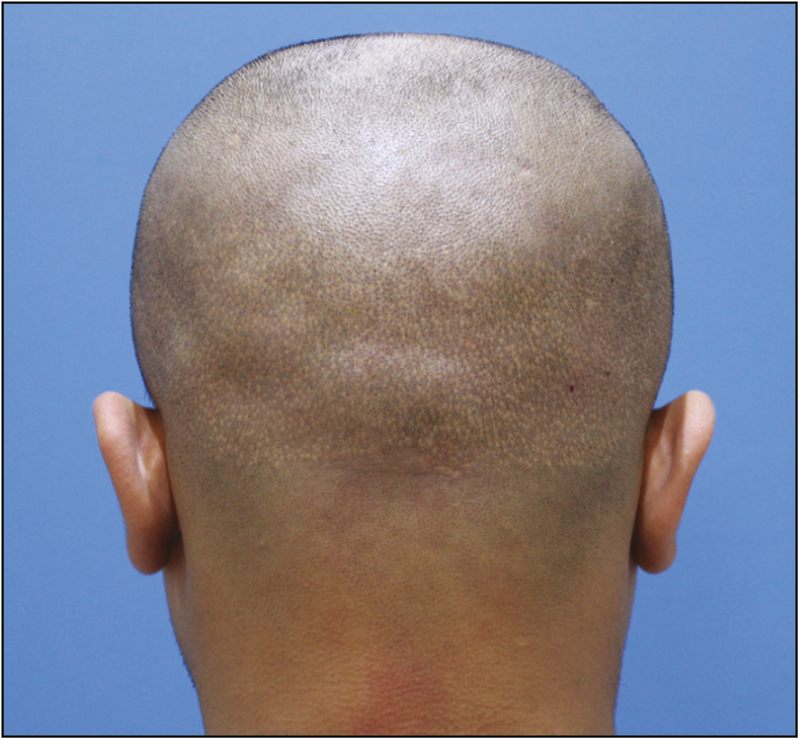 Donovan J. Lichen planopilaris after hair transplantation: report of 17 cases. Dermatol Surg 2012;38:1998-2004. Chiang YZ, Tosti A, Chaudhry IH, Lyne L, Farjo B, Farjo N, et al. Lichen planopilaris following hair transplantation and face-lift surgery. Br J Dermatol 2012;166:666-370. Rodrigues Barata AR, Camacho-Martínez F. Alopecia areata as a complication of hair restoration surgery. Eur J Dermatol 2012;22:813-4. Hwang ST, Park BC. Trichorrhexis nodosa after hair transplantation: dermoscopic, pathologic and electron microscopy analyses. Dermatol Surg 2013;39:1721-4. Unger WP. Complications of hair transplantation. In: Unger WP, editor. Hair transplantation. 3rd ed. New York: Marcel Dekker; 1995. pp. 363-74. Beehner M. Cyst formation post-transplant. Hair Transpl Forum Int 2007;17:30. 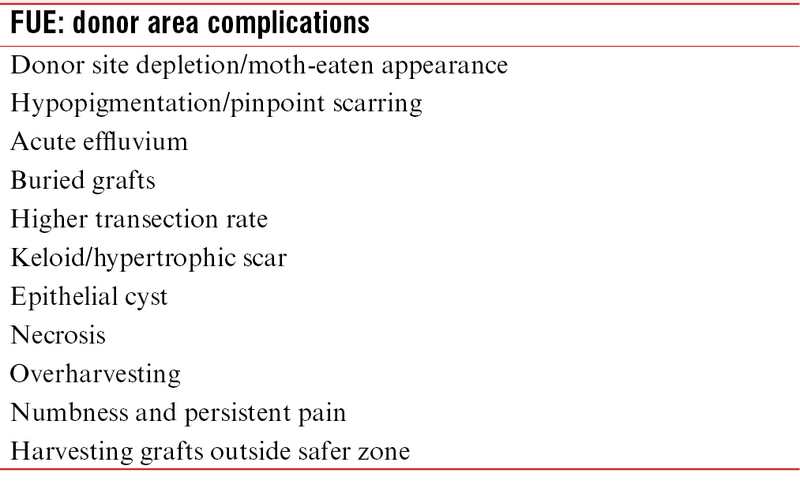 Perez-Meza D, Niedbalski R. Complications in hair restoration surgery. Oral Maxillofac Surg Clin North Am 2009;21:119-48, vii. Gholamali A, Sepideh P, Susan E. Hair transplantation: preventing post-operative oedema. J Cutan Aesthet Surg 2010;3:87-9. 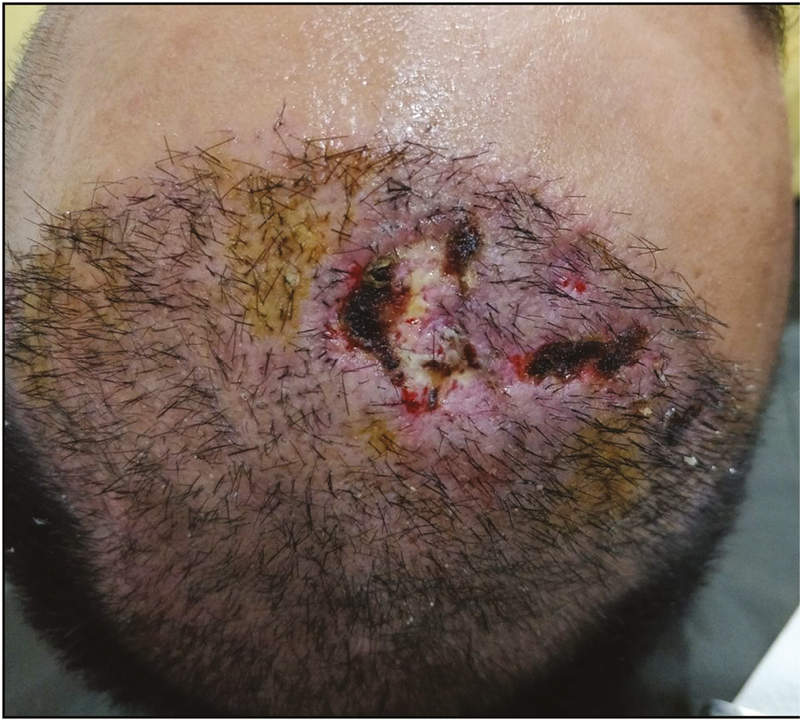 Yildiz H, Ercan E, Alhan D, Sezgin M. Recipient site necrosis after tumescent infiltration with adrenaline in hair transplantation. Acta Dermatovenerol Croat 2015;23: 233-4. Parsley W. Management of the postoperative period: uncommon problems—arteriovenous anastomosis (fistula). In: Unger W, Shapiro R, editors. Hair transplantation. 4th ed. New York: Marcel Decker; 2004. pp. 562-3.